Fiji's flag, adopted October 10, 1970, is light blue with the Union Jack in the upper left corner and the shield of the Fijian coat of arms on the right. The flag of Fiji is a shade of sky blue with the British Union Jack in the upper left corner. 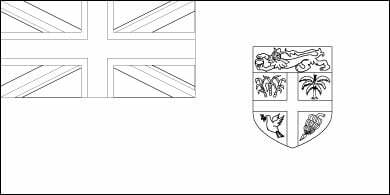 To the right of the Union Jack is the shield from the coat of arms of Fiji. The blue of the Fiji flag reflects the island nation's strong relationship with the Pacific Ocean that surrounds it. The British Union Jack represents Fiji's history as a colony of the United Kingdom. The coat of arms of Fiji in its complete form features the shield of Fiji steadied by two native Fijians, who hold weapons, a sail boat above the shield, and a banner below, which reads “Rerevaka na Kalou ka doka na Tui,” which means “Fear God and honor the queen.” The flag of Fiji features only the shield from the coat of arms, though earlier designs featured the entire coat of arms. The shield is white with a red band across the top third, and a red cross, much like the St. George's Cross used in England's national flag. Across the red band is a lion holding a cocoa pod. The cross segments the shield into four sections, each quadrant depicting features of Fiji, especially the agricultural specialties of the country. Clockwise from the upper left quadrant, the images are sugar cane, coconut palm, bananas, and a dove of peace, holding an olive branch in its beak. The flag of Fiji was adopted on October 10, 1970.